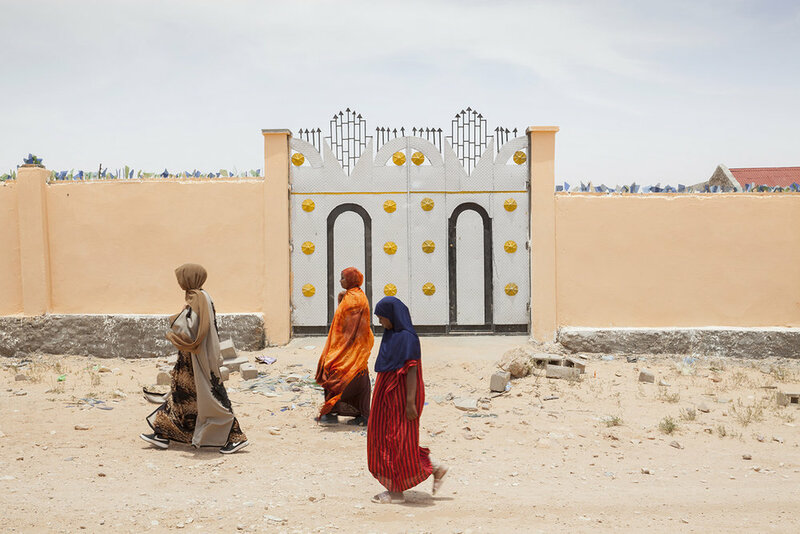 The Anarchist Citizenship, a collaborative project between Dutch photographer Nadine Stijns and curator Amal Alhaag with Somali visual artist Mustafa Saeed, paints Somaliland in a bright and beautiful light. First presented at Unseen Amsterdam and now reprised at LhGWR in The Hague, the multi-sensory installation features photography, textiles, video, soundscapes and sculptural objects that create new perspectives on this often misrepresented, non-recognised autonomous state. The project attempts to document Somalilanders taking agency of their own image. Working closely with the women and youth depicted, and with locals often acting as unofficial art directors by interrupting shoots to give advice – the pictures reflect how young people are shaping their own ideas of citizenship through fashion, friendship and culture. Unlike the typical Western view, which conflates Somaliland with Somalia, presenting both as drought-ravaged countries beset by pirates and terrorism, here we see a modern, well-rounded impression. Making the most of Somaliland’s visual culture and storytelling traditions - and reflecting its rich make-up of Arab, Ottoman, East African and Mediterranean influences - images of Lego-like petrol stations and Modernist buildings are joined by tie-dyed textiles gently blowing in the wind and Gucci scarfs sitting alongside sachets of henna. Crucially though, it’s the beaming portraits of stylish Somalilanders wearing the hijab and cool sunglasses while interacting with the latest Apple products that smash the narrative of Muslim women living in this region. The Anarchist Citizenship is on view as part of a group exhibition at LhGWR until the space closes at the end of November and next year, it will travel to its spiritual home of Hargeisa, Somaliland’s bustling capital city.